Background: Obesity is a major problem in both developed and underdeveloped countries. The aim of this study is to investigate the effects of a physical education program (PEP) on promoting health belief model (HBM) scores, increasing physical activity (PA), and reducing obesity among Iranian high school students. Methods: This quasi-experimental study was accomplished at four high schools that were randomly divided into two groups of experiment (forty) and control (forty) male students in junior high schools in Urmia, Iran. Students in the experimental group received a PEP during 6 months. The essential parameters were used for evaluating the effects of educational program on HBM, PA, and body mass index (BMI) of students. Results: After the intervention of 3 and 6 months, the experimental group showed a significant difference on the results of HBM constructs. According to the result of repeated-measures ANOVA, there is a significant difference between the experimental and control groups about the components of PA constructs. Analysis of covariance showed that although BMI reduced in 6 months after intervention, there was no significant difference in BMI. Conclusions: Results of the study revealed that implementation of PEP was effective on increasing the score of the components of HBM and PA of students. This type of education increases students' awareness of opportunities for increasing PA, expresses methods for removing barriers and negative attitudes about PA, and increases PA. The results of this article showed that the application of PEP is useful to increase the scores of the components of HBM, perception of the first junior high school students about PA and work activity (WA), sports activity (SA), leisure activity (LA), and SLS to manage overweight and obesity. Hence, the present study hypothesizes that PEP can be effective in improving the HBM and PA and reducing the overweight and obesity of the students. This study was a quasi-experimental, TBHE that took place in educational districts of the city of Urmia. After obtaining ethical clearance (ethical code number 393,847), the researcher entered the selected schools. Based on the sample size formula for t-tests, the probability of making Type I error was 0.05, the power of the hypothesis test was 0.8%, Cohen's d effect size was 0.7, and the minimum required sample size in each group was 32. A total of 80 junior high school male students whose age varied between 12 and 14 years old were studied. Four high schools were randomly sampled from two districts in Urmia [Figure 1], and divided into two experimental high schools (n = 40 obese or overweight students) and two control high schools (n = 40 obese or overweight students) from the selected high schools participated in this study. The inclusion criteria were BMI ≥25 and/or no limitation on exercising. The students that were used medications for 6 months known to affect body weight before the study and/or the participants who did not intend to continue the study were excluded from the study. The goal, its importance, and benefits of the study were explained to the participants. Students and their parents were told that participants' profile will be used anonymously, and hence personal information will be strictly confidential. The participants and their parents were informed of the confidentiality of the information and they consented to participate in the study. A hybrid questionnaire was prepared by the researcher which includes variables such as father's education, mother's education, father's occupation, mother's occupation, family size, and rates of weight and height to determine BMI. The components of HBM construct and Baecke et al. questionnaire for measuring PA habits in epidemiological studies, which in most studies of obesity and PA, have been used. The PA was divided into three distinct dimensions: WA, SA, and LA. Weight was taken with light clothing with the aid of a weighing Seca 750 scale with the weights measured to the nearest 1 kg, and height was measured using a stadiometer. Then, BMI was calculated from weight (in kg) divided by a square of the height (in meters). Information was collected by a three-part questionnaire. The first part includes demographic data, the second part was a HBM-based questionnaire that included PSU (α = 0.836), PSE (α = 0.737), PBE (α = 0.773), and PBA (α = 0.885), and the third part was the Baecke et al. questionnaire that included WA (α = 0.726), SA (α = 0.675), and LA (α = 0.881). The questionnaire included 16 items, with proven validity which had been studied in previous studies. Interventional education in the intervention group conducted with lecture, participatory method, group discussion and role playing in six sessions, each session was 1 h.
HBM constructs were utilized to formulate the educational strategies. 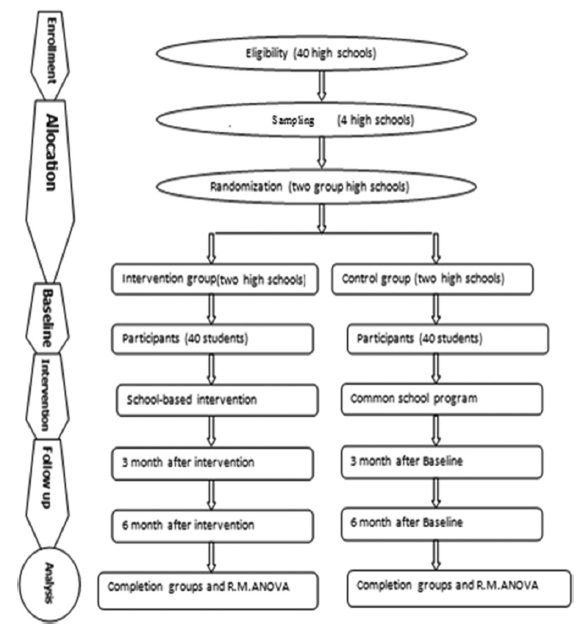 To assess the impact of educational interventions to increase PA and reduce overweight of the participants, the data related to the participants' HBM and PA were collected by the same questionnaire at three times (before, 3 months, and 6 months as follow-up) after the TBHE. The results are expressed as percentages for qualitative variables and mean and standard deviation (SD) for quantities variables in two groups. Chi-square test was used to compare demographical variables and HBM components in baseline, 3, and 6 months after the intervention between the two groups. The repeated-measures (RM) ANOVA was used to assess intervention and time effect on the components of PA constructs. Mauchly's test was used to investigate sphericity, and Kolmogorov-Smirnov test was used to investigate the normality of the distribution for each quantity variable. Furthermore, analysis of covariance (ANCOVA) was used to compare the mean of BMI reduced during 6 months after the intervention. The selected high school students' data were analyzed using the SPSS statistic software version 16, Urmia-Iran. In this study, eighty high school students from Urmia cooperated with the researchers. [Table 1] describes the frequency of demographical characteristics (parent's literacy, their job, family size, and obesity in family) of the students at baseline compared with two groups (experimental and control) of students by analyzing the data using Chi-square test. [Table 2] describes the application of the components of HBM about PA at baseline, 3, and 6 months after intervention by analyzing the data using Chi-square test. 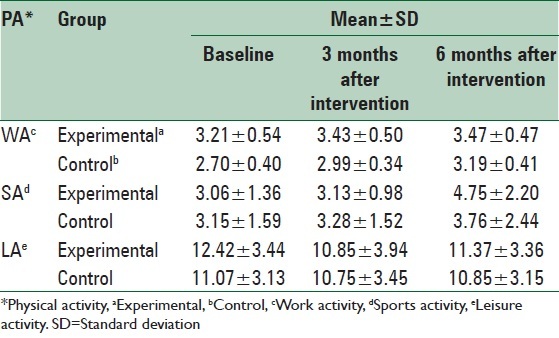 [Table 3] shows the effects of PEP on WA, SA, LA, and BMI in the experimental group in the baseline, 3, and 6 months after intervention by analyzing the data using RM ANOVA. [Table 4] demonstrates the BMI of students at 6 months after the intervention compared with baseline by analyzing the data using ANCOVA. [Table 1] shows the demographic characteristics of the two groups of students. There was no significant statistical difference between demographic variables at baseline. [Table 2] shows the effect of TBHE on the components of HBM constructs 3 and 6 months after the intervention in the experimental and control groups. Chi-square test shows that there are significant differences in many components of HBM 3 and 6 months after intervention in the experimental group in comparison with the baseline (i.e., after 3 months, PSU 2; P < 0.0001, PSE 1; P < 0.0001, PBE 2; P = 0.028, PBA; P < 0.0001, and SE 1, 2; P < 0.0001). 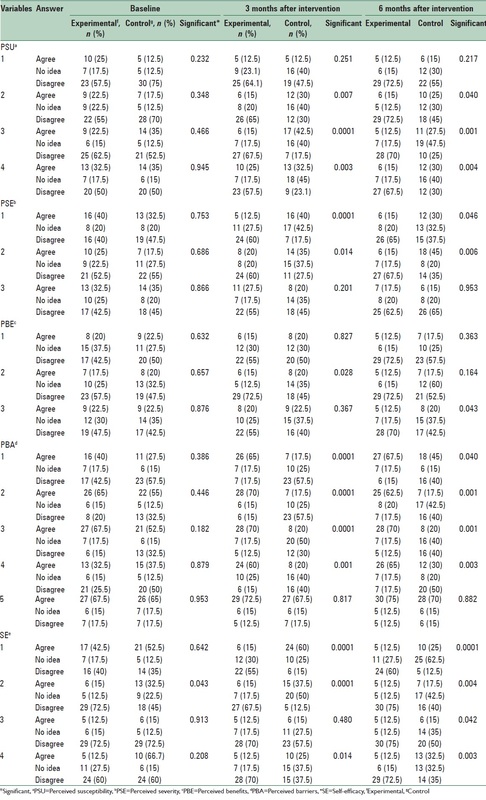 [Table 3] shows the mean and SD in two groups (experimental and control) about the components of PA constructs (i.e., WA, SA, and LA) in baseline, 3, and 6 months after the intervention. The Kolmogorov−Smirnov test prove the normality of the distribution for components of PA in each time (P > 0.05). The intervention and time effect were asses on components of PA constructs. The result of using R.M.ANOVA showed that the main effect of time, the interaction between the time with intervention is significant (P = 0.023), and there is a significant difference between the experiment and control groups in terms of the mean score of work Activity (P < 0.001). Also the result showed that the main effect of time (P < 0.001), and the interaction between the time with intervention is significant P = 0.047, and there is a significant difference between the experiment and control groups in terms of the mean score of Sport Activity (P < 0.001). Also the results showed that the main effect of time P = 0.004, and the interaction between the time with intervention is significant (P = 0.092), and there is a significant difference between the experiment and control groups in terms of the mean score of Leisure Activity (P < 0.001). [Table 4] shows the mean and SD of BMI at the baseline 6 months after intervention. The baseline BMI of participants in the study was 27.20 ± 3.04 for the experimental group and 27.66 ± 3.08 for the control group. The Kolmogorov-Smirnov test showed that the BMI had a normal distribution (P > 0.05). The result of ANCOVA showed that although BMI reduced during 6 months after the intervention, there was no significant difference in BMI 6 months after the intervention, after baseline's BMI was adjusted P = 0. 57. Considering the positive effects of HBM and physical education program on increasing physical activity and reducing the body mass index of students, and also Considering that today's students would be the adults of the future, and given the low cost of prevention of obesity and overweight in comparison with the high cost of treatment, it is essential that educational efforts at the country level based on HBM implemented for all student groups. This study was part of a PhD thesis supported by IUMS (grant No: 393847). Jafari-Adli S, Jouyandeh Z, Qorbani M, Soroush A, Larijani B, Hasani-Ranjbar S. Prevalence of obesity and overweight in adults and children in Iran: A systematic review. J Diabetes Metab Disord 2014;13:121. Heidari K, Minasian V, Marandi SM, Kelishadi R, Khalighinejad P, Davari H. Prevalence of obesity and overweight in 12-14-year-old students in Isfahan-Iran. Int J Prev Med 2014;5 Suppl 2:S120-5. Fallahi E. Vitamin D and obesity: Which one is affected by the other? Nutr Food Sci Res 2015;2:1-3. Franco SS, Wilson S, Devaux M, Cecchini M, Analyst HP. OECD Obesity Update. 2014. Yarahmadi SH, Etemad K, Hazaveh AM, Azhang N. Urbanization and non-communicable risk factors in the capital city of 6 big provinces of iran. Iran J Public Health 2013;42 Suppl 1:113-8. Baghianimoghadam MH, Shogafard G, Sanati HR, Baghianimoghadam B, Mazloomy SS, Askarshahi M. Application of the health belief model in promotion of self-care in heart failure patients. Acta Med Iran 2013;51:52-8. Baghianimoghadam MH, Shogafard G, Sanati HR, Baghianimoghadam B, Mazloomy SS, Askarshahi M. Application of the health belief model in promotion of self-care in heart failure patients. Acta Med Iran 2013;51:53. Taylor D, Bury M, Campling N, Carter S, Garfied S, Newbould J, et al. A review of the use of the Health Belief Model (HBM), the Theory of Reasoned Action (TRA), the Theory of Planned Behaviour (TPB) and the Trans-Theoretical Model (TTM) to study and predict health related behaviour change. The School of Pharmacy, University of London, London WC1N 1AX: National Institute for Clinical Excellence Department of Health; 2007. p. 33. Kelly AS, Barlow SE, Rao G, Inge TH, Hayman LL, Steinberger J, et al. Obesity in children and adolescents: Identifi cation, associated health risks, and treatment. Am Heart Assoc 2013;128:1697. Strong WB, Malina RM, Blimkie CJ, Daniels SR, Dishman RK, Gutin B, et al. Evidence based physical activity for school-age youth. J Pediatr 2005;146:732-7. Baecke JA, Burema J, Frijters JE. A short questionnaire for the measurement of habitual physical activity in epidemiological studies. Am J Clin Nutr 1982;36:936-42. Katz DL, O'Connell M, Yeh MC, Nawaz H, Njike V, Anderson LM, et al. Public Health Strategies for Preventing and Controlling Overweight and Obesity in School and Worksite Settings. A Report on Recommendations of the Task Force on Community Preventive Services. CDC; 2005. Ebadi Fard Azar F, Solhi M, Yekaninejad M, Pakpour A. 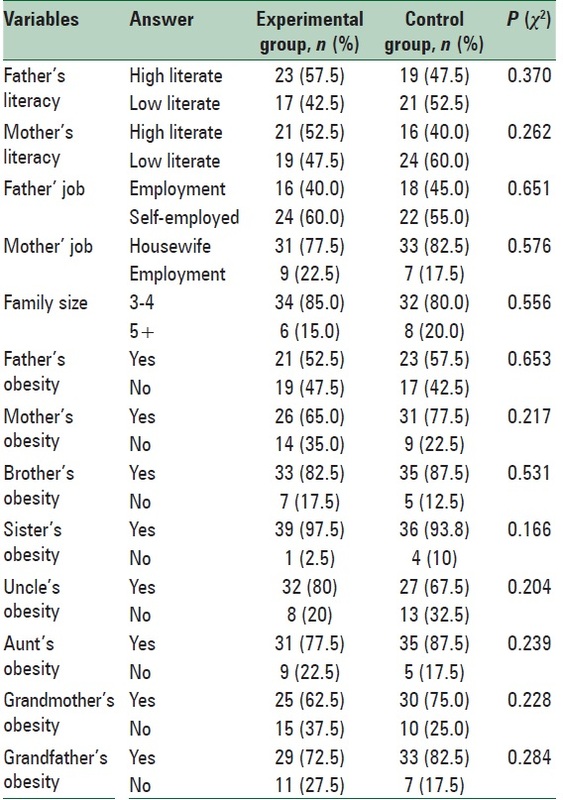 The impact of health education through Health Belief Model (H.B.M) on mother's perceptions about obesity children obese male student in elementary schools. J Health Adm 2006;8:13. Robertson-Wilson J, Lévesque L, Richard L. Using an analytic framework to identify potential targets and strategies for ecologically based physical activity interventions in middle schools. Health Promot Pract 2009;10:232-43. Masumeh S, Yusef M, Javad N, Maryam M. Obesity Among Female Adolescents of Tehran Schools. Journal of Premedical School, Tehran University of Medical Sciences, Peyavard Salamat 1391;6:403-11. Robertson-Wilson J, Lévesque L, Richard L. Using an Analytic Framework to Identify Potential Targets and Strategies for Ecologically Based Physical Activity Interventions in Middle Schools. Health Promotion Practice 2009;10:240-1. Tell GS, Vellar OD. Physical fitness, physical activity, and cardiovascular disease risk factors in adolescents,the Oslo Youth Study. Prev Med 1988;17:12-24. Killen JD, Telch MJ, Robinson TN, Maccoby N, Taylor CB, Farquhar JW. Cardiovascular disease risk reduction for tenth graders. A multiple-factor school-based approach. JAMA 1988;260:1728-33. 19 Epstein LH, Smith JA, Vara LS, Rodefer JS. Behavioral economic analysis of activity choice in obese children. . Health Psychol 1991;10:311-6. Epstein LH, Saelens BE, Myers MD, Vito D. Effects of decreasing sedentary behaviors on activity choice in obese children. . Health Psychol 1997;16:107-13. Ford BS, McDonald TE, Owens AS, Robinson TN. Primary care interventions to reduce television viewing in African-American children. Am J Prev Med 2002;22:106-9.